Highland dancing is organized around numerous competitions that keep students motivated as they progress through the various levels from Primary to Premier. Personal growth is encouraged as the dancers work towards the various competitive levels. These competitions also offer the opportunity to meet and become lifelong friends with dancers from other areas, both nationally and internationally. These are the first dances competitors learn, and are the only dances competed at championships. The movements in the steps for each dance are specifically described by the SOBHD. In most competitions, dancers may dance steps chosen by their teachers. For championships, the dancers must dance steps chosen by the SOBHD technical committee each year. This victory dance is perhaps the oldest dance and is said to have been done on the targ or shield of the defeated warrior. The entire dance is performed in one spot and precision footwork is a must. Prior to entering into battle, soldiers would perform this dance over crossed swords. If the dancer touched or displaced the sword, it was a bad omen. Following the unsuccessful rebellion of 1745, the English were in power over Scotland, and forbade the Scotsmen to wear their beloved kilts. This dance represents shedding the cumbersome trousers in favor of wearing free flowing kilts after that ban was lifted 40 years later. Performed by four dancers competing individually, this dance is said to have originated one cold Sunday morning in Scotland when the minister was late arriving at the Kirk, or church, and the parishioners were left outside in the cold. In an attempt to keep warm, the dancers weave around each other. As dancers progress, they begin to compete in national dances. These character dances may have originated as ladies step dances, recruiting or calisthenics for soldiers, or dances designed to honor historical figures. Today, both male and female dancers compete in all dances. These dances incorporate more opportunity for personal expression, and are comprised of steps specifically described by the SOBHD and the three examining bodies (BATD, SDTA, and UKA). Some competitions also include opportunities for choreography, sanctioned by the SOBHD as individual, duet, or group competitions. The students or their teachers choreograph these dances based on movements reflecting Scottish style rather than sequencing set steps, and offer the greatest opportunity for individual expression. Dancers perform and compete in costumes both colorful and rich in Scottish history. Female dancers are expected to wear a kilt in a tartan of their choice, a white blouse, and velvet vest or jacket, full clan hose, dark briefs, and ghillies (shoes). The vest or jacket is embellished with either gold or silver braid and buttons. Pre-Premier dancers may substitute white or plain colored knee socks to coordinate with the color of their kilts. 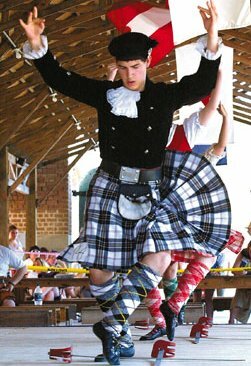 The male dancer’s costume includes a kilt, shirt, tie, vest, wool or velvet jacket, sporran, and hat. Pre-premier dancers may wear a white shirt and tie, leather sporran, and white or plain colored knee socks to match their kilts. The cost of a new complete outfit can range up to $1000 depending on the size and yardage of the kilt. Fortunately these costumes rarely wear out before they are outgrown and can be bought and sold on the used market for reduced prices. For the national dances, girls may wear either a white dress with a tartan sash worn over the right shoulder, or a knee length gathered skirt of tartan or plaid material, with a white blouse and velvet bodice, and a one yard square “plaid” fastened over the right shoulder with a brooch. This costume is known as an Aboyne dress, named after a small town in northwest Scotland. Both styles require a white underskirt and white socks or natural hose. Costumes for the jig and hornpipe are also specifically prescribed and dancing teachers have this information readily available. Typically (although not a rule), female dancers have their hair off their neck in a “bun” or braid, as loose hair is a distraction to the dance. A number of Scottish import suppliers in the US and Canada are available to assist with dancers’ needs. Any dancer who plans to compete must register with FUSTA at the regional level and obtain an SOBHD worldwide registration card. This card indicates the competition level of the dancer: Primary, Beginner, Novice, Intermediate, or Premier. Primary is the only level determined solely by the dancer’s age. In the Beginner and Novice categories, a competition win of at least one 1st, 2nd, or 3rd place medal entitles the dancer to receive a stamp on their registration card. When a dancer has six stamps, or has been in the category for six months (whichever is longer), she/he progresses to the next level. Intermediate dancers remain in the category for one calendar year from the date of their first Intermediate competition. After that time is up, regardless of how many wins, dancers move into the highest and most prestigious category, Premier, where they will remain for the rest of their dancing career. All dancers are required to re-register every year. Primary dancers do not get their cards stamped. Dancers must present their registration cards at each competition in order to receive their awards. This registration scheme is a very effective way of keeping track of the dancer’s progress, and ensures that every dancer has the opportunity to compete with others of comparable ability throughout the world. In addition to competitions, dancers also have the opportunity to track their dancing progress through medal tests and grade level exams. Offered throughout the year, these tests measure a dancer’s progress against a “standard” level rather than against other competitors. The higher the testing level, the more difficult the standard. Grade level exams prepare dancers to take teaching exams once they turn 16. The Federation of United States Teachers and Adjudicators (FUSTA) was established in 1980 to promote Scottish highland dancing and culture in the United States and to provide a “community” network for teachers and judges. FUSTA is the US affiliated organization of the Scottish Official Board of Highland Dancing (SOBHD), which is the worldwide governing body of highland dancing. As such, FUSTA ensures that all competitions and championships are run according to SOBHD standards. These uniform standards enable dancers to compete worldwide. The FUSTA Board of Directors is composed of six officers elected nationwide and six delegates elected by the six FUSTA geographic regions which encompass all fifty states: East, Midwest, Northwest, Southeast, Southwest, and West. FUSTA’s interests in Scotland are represented by its Scottish delegates to the SOBHD, who cast FUSTA’s five votes on any official business. Each year, FUSTA hosts the United States Inter-Regional Championship (USIR). This championship rotates among the six US regions. FUSTA also supports on-going professional development for teachers and judges, provides the communications link in the Scottish dancing community, and acts as the resource center in the United States for all aspects of highland dancing. FUSTA also provides a variety of scholarships to dancers and recognizes the achievements of teachers and judges through its Hall of Fame awards. This 501(c)(3) non-profit organization is supported by membership fees and tax-deductible donations.